Visit Tucson was honored Monday (January 28) by the Tucson Airport Authority (TAA) Board of Directors with the inaugural Building Bridges Partnership Award in recognition of its sustained partnership, collaboration, information sharing and advocacy that has helped grow air service at Tucson International Airport (TUS). TAA Board Secretary Bruce Dusenberry, left, with Visit Tucson President and CEO Brent DeRaad and Executive Vice President Felipe Garcia receiving the Building Bridges Award. 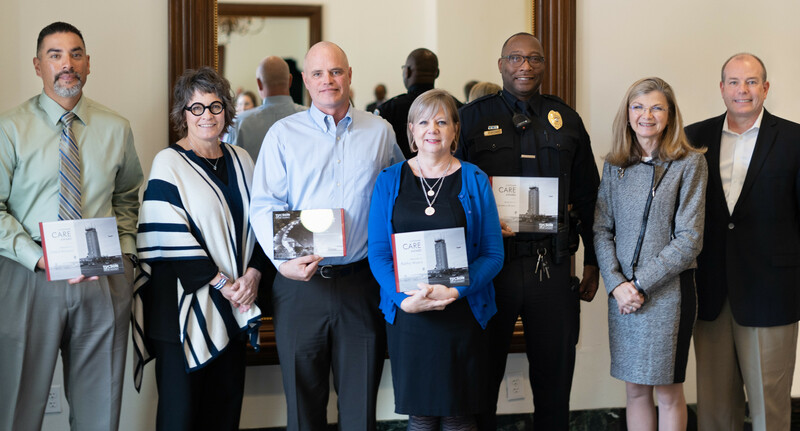 Coming off a year of successes and growth, the Board developed the idea of honoring a community partnership and TAA employees who have contributed to the organization’s achievements. “As we learned last year, the TAA contributes $7.4 billion annually to our region’s economy and we feel it’s important to recognize and show our appreciation to those who help make that happen,” said TAA Board Chair Lisa Lovallo. 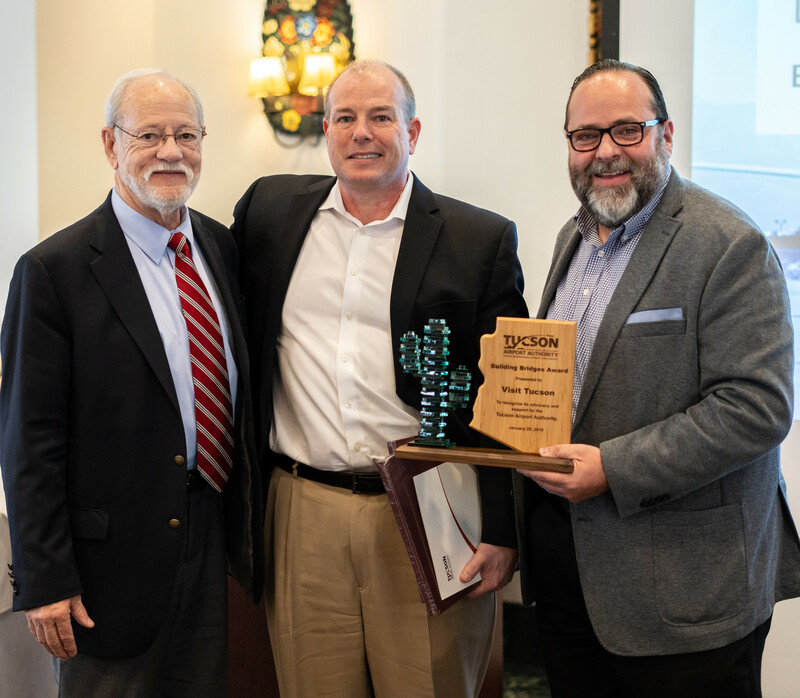 Visit Tucson’s President and CEO Brent DeRaad and Executive Vice President J. Felipe Garcia received the previously unannounced award at the TAA’s Annual Membership Meeting at the Arizona Inn. “The TAA would not have achieved the success of bringing new air service to our region numerous times over the past years without the partnership and support of Visit Tucson,” Bonnie Allin, TAA President and CEO, said in the nomination submitted to the Board. Specifically, Visit Tucson was instrumental in helping to bring ultralow-cost carrier Allegiant Air to Tucson in November, assuring the success of other airlines’ new flights to Minneapolis and Portland and growing existing air service from Chicago, Denver and Seattle with its “Free Yourself” marketing campaigns promoting Tucson as an unpretentious destination for active, casual travelers. Visit Tucson’s Mexico Marketing Division, Vamos a Tucson, has also been leading efforts in helping maintain relationships as the TAA continues to seek a return of regularly scheduled international airline service. The TAA Board gave two other awards Monday, both honoring TAA Team Members. Matt Chandler, Application Design and System Administrator in the IT department, received the Innovative Spirit Award for his development, implementation and management of a cyber security testing and training program that has shown to be highly effective in educating TAA Team Members on how to recognize and be more aware of dangerous phishing emails. There were so many outstanding nominations for TAA’s new Customer CARE Award, the TAA Board decided to recognize three employees: Cornelius Brown, a TAA Police officer; Kathy Myers, procurement manager ; and Gilberto Rodriguez, an airfield maintenance specialist. In this case, CARE is an acronym for Courtesy, Attitude, Responsiveness and Exceed Expectations, which are the customer service standards for everyone at TAA. In inaugurating the awards, the TAA Board said the intention is that each be given annually. Nominations for the Building Bridges Partnership Award can come from any member of the TAA or its management. Nominations for the two employee awards can be made by any other TAA Team Member. All nominations are submitted to the TAA Board of Directors for its review, consideration and ultimate decision. From left, Gilbert Rodriguez, of TAA’s Maintenance Department; Lisa Lovallo, TAA Board Chair; Matt Chandler, of TAAs Information Technology Department; Kathy Myers, of TAAs Procurement Department; TAA Police Officer Neal Brown; Bonnie Allin, TAA President and CEO; and Brent DeRaad, President and CEO of Visit Tucson, took part in the TAA Board’s Inaugural Awards honoring those who have helped the Tucson Airport Authority achieve success.